What’s the July birthstone? There are a few different answers to this question, but ruby birthstones remain the most popular choice. Beautiful gemstones of the corundum family, rubies come in various shades of red that remind many people of love’s transformative power. 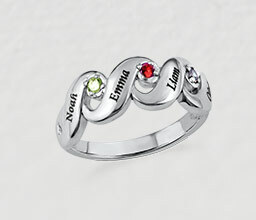 At MyNameNecklace, we carry incredible birthstone jewelry for every occasion. Before you explore, we invite you to learn more about some of the lore associated with this exquisite gemstone. 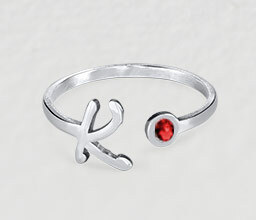 Perhaps because of their brilliant red color, rubies are often used to symbolize love. Besides its connection with passionate feelings, this exquisite birthstone has been said to renew energy and restore one’s zest for life. The ruby’s connection to the heart center goes deeper than romance, though! In crystal healing, rubies are associated with the heart and the body’s circulatory system. Said to balance and detoxify the body while promoting good health, this stone brings a feeling of energetic clarity to the wearer. Large, perfect rubies are rare – so rare in fact, that they were once owned almost exclusively by royalty. Wealthy individuals believed that fine rubies would attract even more gemstones while providing an incredible amount of protection. Not only was the wearer believed to be safe from harm, but personal property was thought to be protected as well. This protective influence was so strong that English author Sir John Mandeville wrote: “Once a man had touched the four corners of his land with his ruby, then his house, vineyard, and orchard would be protected from lightning, tempests, and poor harvest.” In yet another association with the heart, rubies worn on the left side of the body were believed to bring feelings of peace, even during storms that threatened home and hearth. Besides offering the ability to provide physical protection, rubies were believed to provide their wearers with clairvoyance, and even change color to warn their owners of impending doom. Whether you believe that there’s anything to the myths and legends surrounding rubies, one thing is clear: We can all benefit from things that remind us of love, wisdom, and good fortune – a birthstone ring makes the ideal example. Consider wearing it on the left, and see whether luck comes your way. In any case, you’ll appreciate its stylish look! Whether you celebrate your birthday in July, or if you simply love the brilliant red color of this month’s birthstone, you’ll find that there are lots of ways to celebrate life’s meaningful milestones – perhaps with an engraved necklace to remind the wearer of the ones they love. We put birthstones in easy reach with Swarovski stones, which offer the same beautiful colors as the real (but far more expensive) thing! Our birthstone ring, for example, offers the same sparkle as a ring with real gems, but at a fraction of the cost – and with added personalization, too! Why not treat yourself or someone special? 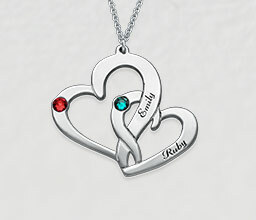 Moms and grandmas everywhere adore mothers necklaces and birthstone necklaces for grandma in a variety of styles. Whether engraved with names, birth dates, or inspiring words, they make amazing gifts that are always well-received. 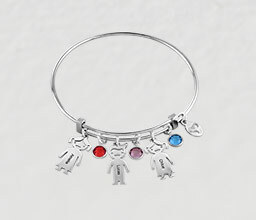 Mother rings have been updated for those who appreciate contemporary styles, and our bangle bracelet with kids charms is popular, too. 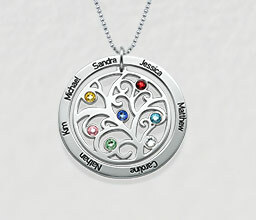 Meanwhile, a family tree birthstone necklace makes a fantastic gift for anyone with lots of children or grandchildren to love. With so many personalized jewelry styles from which to choose, it has never been easier to express yourself with a unique design that’s sure to please its wearer while promoting good feelings.